Wednesday, August 11, 2010 \AM\.\Wed\. One of the largely unsung heroes of the American Revolution is George Rogers Clark. The campaign that he fought in Illinois and Indiana secured to America a claim to these territories that was recognized in the treaty ending the war. In 1778 Virginian Clark, at 25, was already a seasoned veteran of the savage warfare that raged on the Kentucky frontier throughout the Revolution. Lieutenant Colonel Henry Hamilton, known to the patriots as “Hair-buyer” Hamilton, from Detroit constantly aided the Indians war against the settlers in Kentucky, and paid generous bounties to the Indians for the prisoners and scalps they brought him. Clark realized that the best way to stop the raids into Kentucky was for the patriots to go on the offensive and seize British outposts north of the Ohio river. Recruiting 150 men to form what he called the Illinois regiment, Clark, a Lieutenant Colonel in the Virginia militia, led his force into Illinois and took Kaskaskia on July 4, 1778. The men of the Illinois regiment received an enthusiastic reception from the French, largely due to the efforts of Father Pierre Gibault, Vicar General of the Illinois Country, and Frenchwomen soon busied themselves sewing flags for the regiment. Cahokia and Vincennes were taken without firing a shot, and British power in Illinois and Indiana seemed to vanish over night. Wednesday, July 21, 2010 \AM\.\Wed\. Michael Zak does what all too many on the left fail to do: crack open some history books and take a real look at the history of the Ku Klux Klan. Zak correctly notes that when the Klan was at its zenith during the 1920s, it was a terrorist wing of the Democratic party, and that since its inception, Republicans were at the forefront in trying to take it down. It would have been far more truthful for the congresswoman to have admitted the fact that all those who wore sheets a long time ago lifted them to wear Democratic Party clothing. Yes, the Ku Klux Klan was established by the Democratic Party. Yes, the Ku Klux Klan murdered thousands of Republicans — African-American and white – in the years following the Civil War. Yes, the Republican Party and a Republican President, Ulysses Grant, destroyed the KKK with their Ku Klux Klan Act of 1871. How did the Ku Klux Klan re-emerge in the 20th century? For that, the Democratic Party is to blame. It was a racist Democrat President, Woodrow Wilson, who premiered Birth of a Nation in the White House. That racist movie was based on a racist book written by one of Wilson’s racist friends from college. In 1915, the movie spawned the modern-day Klan, with its burning crosses and white sheets. Inspired by the movie, some Georgia Democrats revived the Klan. Soon, the Ku Klux Klan again became a powerful force within the Democratic Party. 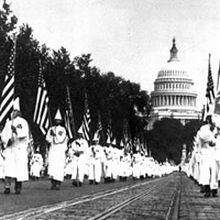 The KKK so dominated the 1924 Democratic Convention that Republicans, speaking truth to power, called it the Klanbake. In the 1930s, a Democrat President, Franklin Delano Roosevelt, appointed a Klansman, Senator Hugo Black (D-AL), to the U.S. Supreme Court. In the 1950s, the Klansmen against whom the civil rights movement struggled were Democrats. The notorious police commissioner Bull Connor, who attacked African-Americans with dogs and clubs and fire hoses, was both a Klansman and the Democratic Party’s National Committeeman for Alabama. Starting in the 1980s, the Democratic Party elevated a recruiter for the Ku Klux Klan, Senator Robert Byrd (D-WV), to third-in-line for the presidency. I have one quibble with all this. It focuses too much on the partisan aspect of the KKK and not enough on its ideological drive. After all, modern day Democrats could just claim that the Klan represented the conservative wing of the Democratic party. This would be an error. Saturday, July 17, 2010 \AM\.\Sat\. Something for the weekend. Stonewall Jackson’s Way, sung by the endlessly talented Bobby Horton who has waged a one man crusade to bring Civil War music to modern audiences. Of Thomas Jonathan Jackson, nicknamed Stonewall by General Barnard Bee at the battle of Bull Run, it was said he lived by the New Testament and fought by the Old. Certainly throughout his life he was a convinced Christian. As a young man he would attend services of various Christian denominations. In Mexico, during his service in the Mexican War, he attended mass, although sadly he did not convert to Catholicism. Instead he eventually became a Presbyterian. His Bible was his constant companion, and he would often speak of God and theological matters in private conversation. Jackson in his professional life was a soldier. Just before the Civil War he was a professor of natural and experimental philosophy (science) and artillery instruction at the Virginia Military Institute. As a teacher he made a good soldier. His lectures were rather dry. If his students seemed to fail to grasp a lecture, he would repeat it the next day, word for word. His home life was a mixture of sorrow and joy. His first wife died in childbirth along with their still-born son, a tragedy that would have crushed many a man less iron-willed than Jackson. His second marriage, like his first, was happy, but heartache also haunted it. A daughter died shortly after birth in 1858. A second daughter was born in 1862, shortly before Jackson’s own death in 1863. Saturday, July 3, 2010 \PM\.\Sat\. Thursday, July 1, 2010 \AM\.\Thu\. Thomas Jefferson and John Adams died on July 4, 1826, fifty years to the day from the adoption of the Declaration of Independence by the Continental Congress on July 4, 1776. Jefferson died before Adams, and therefore Adams was in error when, with his last breath, he said “Thomas Jefferson survives.” However, in a larger sense, a part of Mr. Jefferson, Mr. Adams and all the patriots who brought us our independence, will remain alive as long as Americans continue to read and remember the Declaration of Independence. Is Robert E. Lee Overrated? Friday, June 18, 2010 \AM\.\Fri\. Paul Zummo, the Cranky Conservative, and I run a blog on American History: Almost Chosen People. Yesterday Paul raised the question: Is Robert E. Lee Overrated? Yeah, the post title is somewhat deliberately provocative, but it’s also meant to be a serious question that I hope will spark some discussion. I was going to ask it in the comments to Donald’s post below, but thought it might be useful fodder for debate in its own right.